Tonight brings a show your humble Show Report writer has been anticipating for a long time: An all-star cast of performers, including members of The Eric Weiler Band, The Bootheel, The BoogeyMen and more combine talents in a Bruce Springsteen tribute at Lindberg’s. Why, you ask? It’s National Boss’s Day, and how better to pay tribute to bosses than to pay tribute to “The Boss.” The night will start with a special treat: An all-acoustic set by Eric Weiler (of The Eric Weiler Band) and Todd Balisle (of The Bootheel) playing all of Springsteen’s 1982 album Nebraska. After that, it’s time to pump fists and shout choruses, and you can bet this word-typing goofball will be in on it at some point. Lots more after the break, too. Get ready to barhop. It’s a good night for creativity’s many forms, Springfield, and you’ll find tonight’s shows are appropriately all over the map. At The Outland Ballroom you’ll find a feisty hard-rock show, singer-songwriter showcasing at Lindberg’s, less structured showcasing at The Outland and Dennis’ Place and more. Click through for the details. Tonight brings to Springfield a show several weeks in the making, and it’s a feel-good feather in the city’s musical cap to boot. It’s story time: A few weeks ago we received an email from North Carolina-based rock group Red Collar, a talented young band with the good fortune to have already played shows opening for acts such as The Gaslight Anthem, Riverboat Gamblers, …And You Will Know Us By the Trail of Dead and more… and they just released their first album, Pilgrim. They had the bad fortune of having a show date fall through between their Little Rock and St. Louis dates, and they wanted to put something together in Springfield. We put out the APB with clubs we thought would suit their style, and the band was not only hooked up with a first-time-ever show in Springfield tonight at Lindberg’s, but discussions are underway for another show in town at Nathan P. Murphy’s when the band passes back through. The city’s music venues turned out for the band; hopefully its music heads will, too. Mark Bilyeu will also be putting on his acoustic performance at the bar earlier in the evening, the next-to-last acoustic show Bilyeu currently has booked in the club. Catch both while you can. Tonight brings us the second helping of local Social Distortion tribute group The Shin Kickers, playing Lindberg’s in all their punk-meets-greaser glory. Their first appearance was to a packed room of onlookers in the spring as they played Social D’s live album Live at the Roxy, but tonight the band will take on a set list made up of the group’s latter-day material. We’re betting it includes this classic, plus more than a few other tunes instantly recognizable to fans. Today your trip through the music scene starts a few hours early, and in a location we haven’t gotten to talk about music at for quite a while. 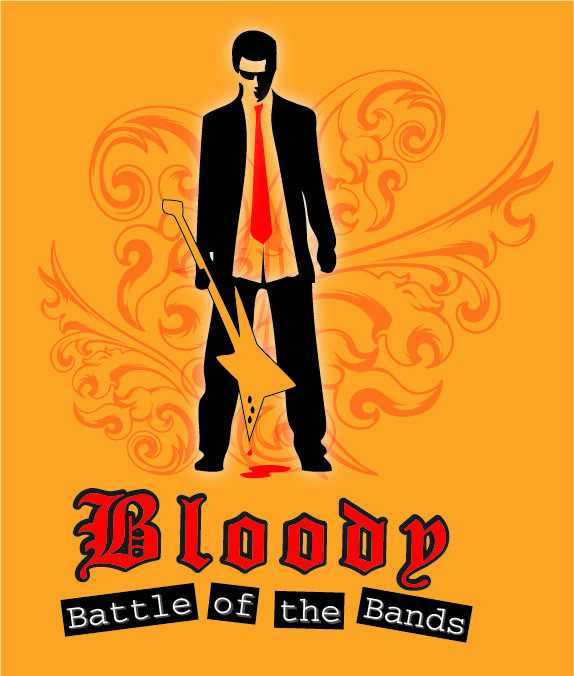 The Bloody Battle of the Bands starts at 3 p.m. at Remington’s Southside, with seven high-school-age bands competing for sweet prizes before headliners Someone Still Loves You Boris Yeltsin and Black Box Revue close out the evening. Like what you hear and want to vote for one of the battling bands? All that’s needed in exchange for a ballot is a pint of your blood for the Community Blood Center of the Ozarks–a life-saving gift for someone in need, meaning you contribute to two important events in one sitting. There are those unusual moments in music where you see a performer play and excel in different context, something unexpected that only serves to increase your respect for the artist. It’s with that feeling in mind that we give a shout-out to Reed Heron, bass player for local rock stalwarts Speakeasy, who fills in on the four-string tonight with blues/rock group Trash Angels at The Daily Pub. The band just played its last official show with current bassist Landon Rolfe and has a week’s wait before its once-and-future bassist, Eric Guinn, takes over. Though it’s a non-issue this weekend since singer Tiffany Rene and guitarist Donnie Ray will be out of town prepping to record the band’s next album, but tonight is Trash Angels’ weekly Daily Pub gig, and the weekly shows are the bread and butter of the band’s schedule. Heron to the rescue, picking up on the band’s songs and jumping into the lineup for a one-night-only gig. No surprise, really, as his work each Wednesday with the improv-hip hop group Urban Legend has no doubt kept up his chops and ability to learn on the fly, not to mention his stint with the other members of Speakeasy as the backing reggae band for former Jah Roots singer Josh Heinrichs. It should be a good show, and one you’re not likely to see again. We don’t envy The Outland Ballroom’s crew tonight. Okay, maybe we do a little. They’ll be called upon to preside over two big-drawing shows, which would exhaust just about everyone except maybe this little guy. On the plus side, they’ve got a front-row seat for Boba Flex, The Dogs Divine, Six Shots Till Dawn and Adara early and Spookie Daly Pride, Roots Of Mankind and BringYourGreenHat late. Not a bad night’s work by any measure. You’ll want to be at the Ballroom at 5 p.m. for doors to the early show and at 9 p.m. for doors to the late show… unless, of course, you’re part of the staff, in which you’re probably already there and settled in for a long, huge night. The Show Report, 7/22: Surprise! We’ve arrived at Hump Day, that day in the week where, once it passes, our attention spans slowly dwindle until the weekend arrives and it’s time to go about the business of entertaining ourselves. That would make Hump Day out to be a bit of a lull, and while it may be true that this is the only night this week without a major traveling act coming through Springfield, it is far from quiet. Out of the blue, Joey Rowlett, bassist of Matt Stell & The Crashers, phoned us to mention a surprise acoustic show tonight at Dennis’ Place (921 W. Sunshine St.) in which he, Stell and John D. Hale will all be performing. As if the chance to see three luminaries among the Red Dirt country acts in our music scene wasn’t reason enough to attend, the show, Rowlette tells us, is FREE. We hope Dennis’ stocked up on its whiskey. The special concert begins tonight at 9 p.m. The Show Report, 7/21: Don’t Hurt my Sick Puppies! 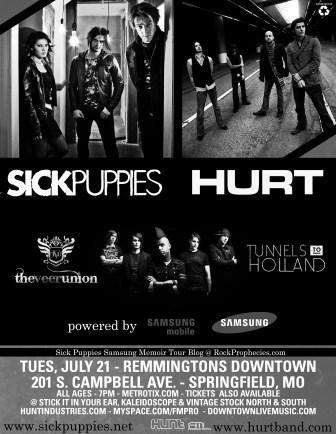 Tonight it’s FM Productions‘ turn to take the wheel and put on the night’s big show: Hurt, Sick Puppies, Tunnels to Holland and The Veer Union at Remmingtons Downtown. The Shrine Mosque gets quiet show-wise in the summertime–it’s an old building and hard to keep cool–but FM occasionally will put on a show in another spot and keep the ball rolling. It should be rolling quite well tonight–a summertime Tuesday, mind you. No tumbleweeds rolling through town this year, that’s for sure. 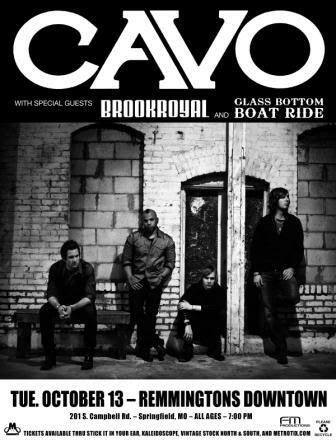 Be at Remmingtons early for the 7 p.m. door time; there should be a pretty good crowd for this one. * BIG local hip hop show at The Blue Room at Billiards of Springfield: AcuMen, MC Tommy P of The Spacetones, SincerelyYours, Rhyme University (from Columbia, MO) and Roots Of Mankind. A lot of show for five bucks, eh? Starts at 9 p.m.